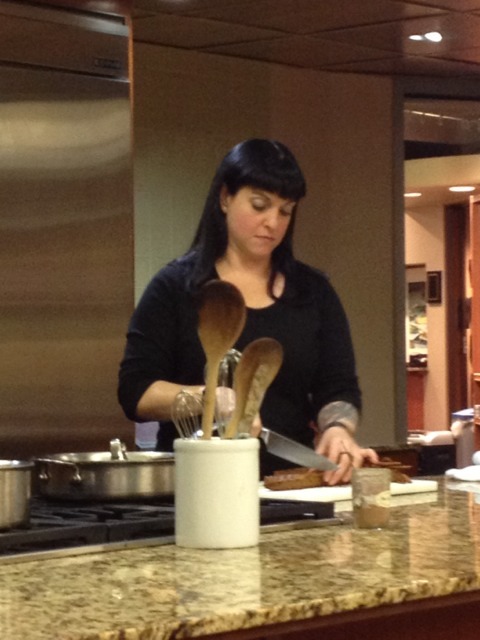 Before I get to the recipe of the day, last night, I had the awesome opportunity to go to a cooking demonstration given by Melissa Joulwan herself at Whole Foods. The class was titled "Paleo Thanksgiving." Cake cutting is serious business. She demonstrated three yummy side dishes and a dessert that could be made for Thanksgiving (or any night, really). I forgot to take pictures of the first two dishes as I was too eager to dig in, but they were Cranberry Waldorf Salad and Coconut-Almond Green Beans. Despite the serious look on her face in the picture above, she was legitimately giddy showing us how to replace some traditional Thanksgiving dishes with healthier versions. My new kitchen mantra will now be, "It's fine. It's all fine." Here is her "Velvety Butternut Squash." 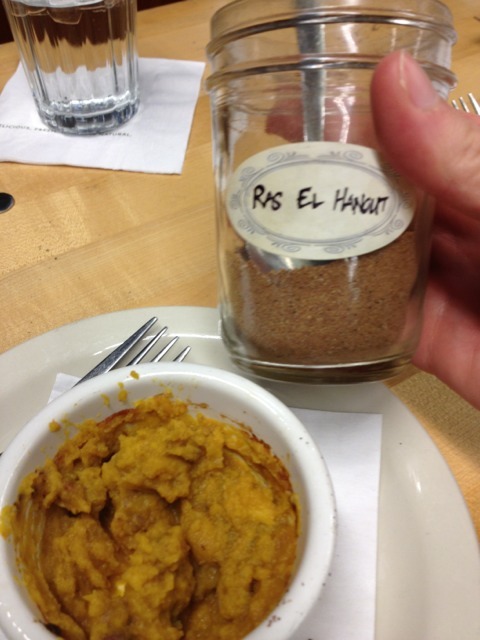 She passed around her own jar of her Ras El Hanout seasoning around the room to smell and sprinkle on the squash, which was heavenly. The dessert she demonstrated was Pumpkin Gingerbread Cake with Maple-Vanilla Frosting. I was glad to hear that she has the same opinion about paleo treats that I do. They may be "paleo" but they are still treats. For those who are cooking Thanksgiving dinner, she mentioned this blog post where she gives 10 recommended side dishes. 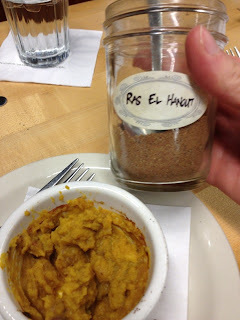 The green bean and butternut squash recipe from the class are both in that post! Throughout the class, she invited questions from the crowd. She is working on a new cookbook to follow up Well Fed which will hopefully be out next October. She sadly dispelled rumors that she was working on opening a paleo restaurant in town. 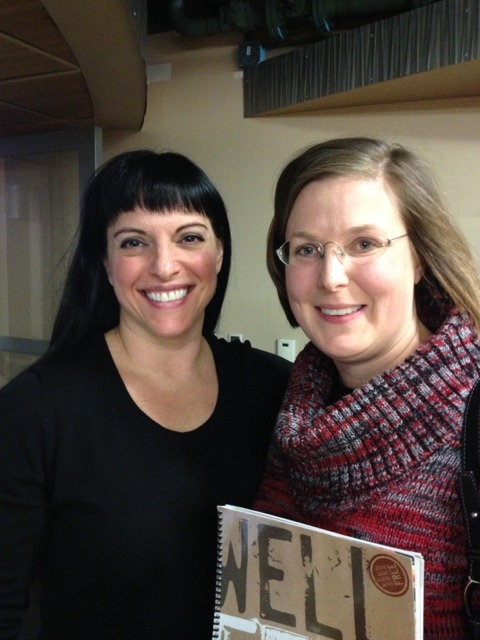 I got my copy of Well Fed signed an she graciously posed for a picture with my paleo star struck self. For those of you in the Austin area, she will be having some hands-on "Paleo Basics" cooking classes on January 23 and February 27. In those classes you will actually cook a few basic paleo recipes. You can't sign up yet, but be on the look out! Melissa has the classes mentioned on her events section at her blog and I bet she'll add the sign up links when they are available. 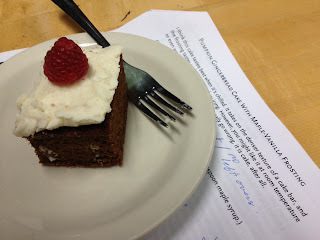 Here is a link to Whole Foods Austin's Cooking Class Calendar. The Paleo Review: Thumbs Up! Seriously, if you are in the Austin area, sign up! And now, back to my second installment of paleo fear factor. 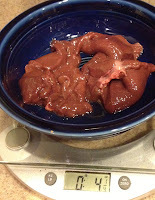 As you may recall, I recently gave chicken liver a try and didn't like the texture. 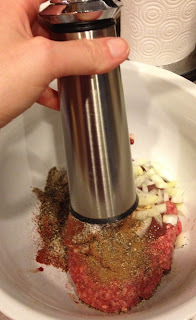 I decided I had to give beef liver a try, and settled upon this recipe from The Food Lovers Kitchen as a good "gateway" recipe for eating liver. 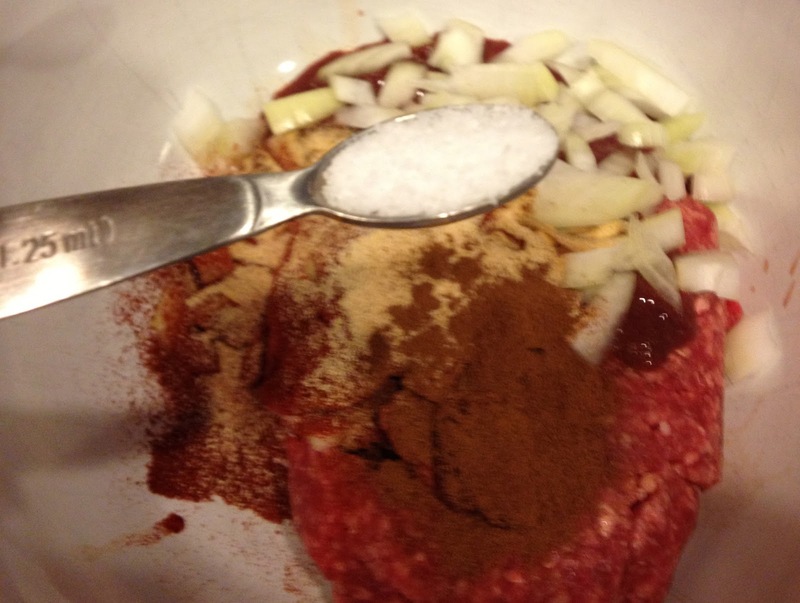 First, I gathered my ingredients. And pre-heated my oven. I weighed out a quarter of a pound of liver and put it in my mini chopper. 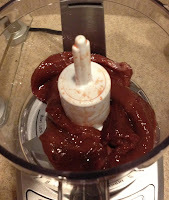 I processed the liver until smooth. Rather than cut of up the liver, I figured, if the point is to hide the liver, the more processed the better. 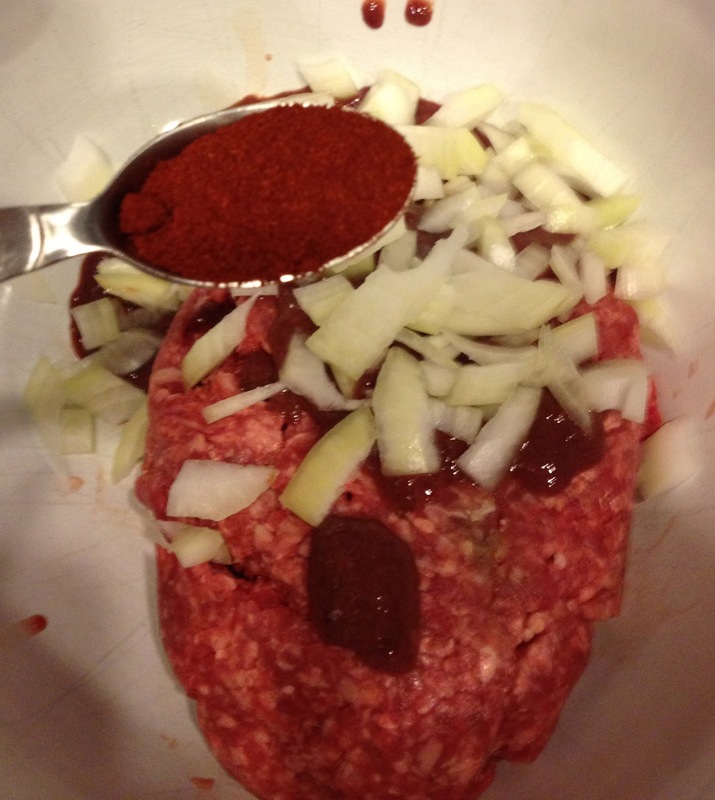 In a large bowl, I added my liver to my ground beef. 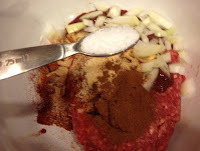 I diced my onion and added it as well. 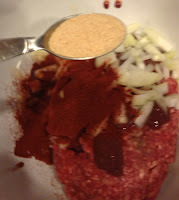 I then added all of the spices. 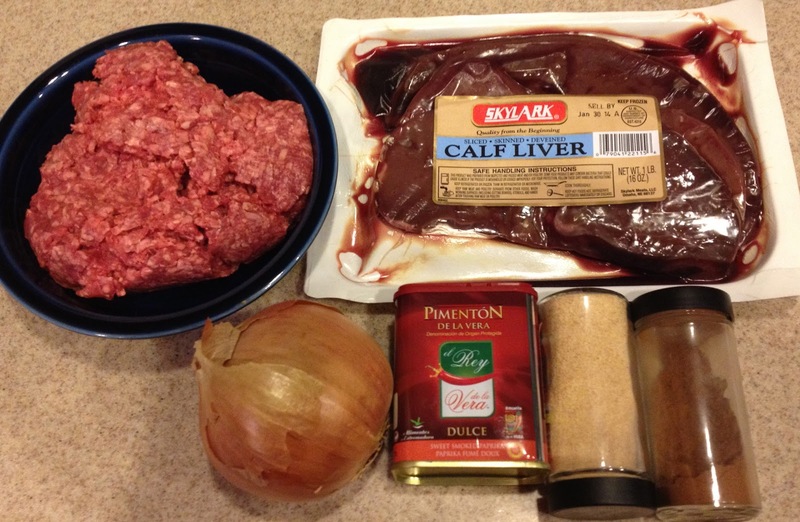 You'll see I aimed to cover up the liver with all of the additional ingredients. 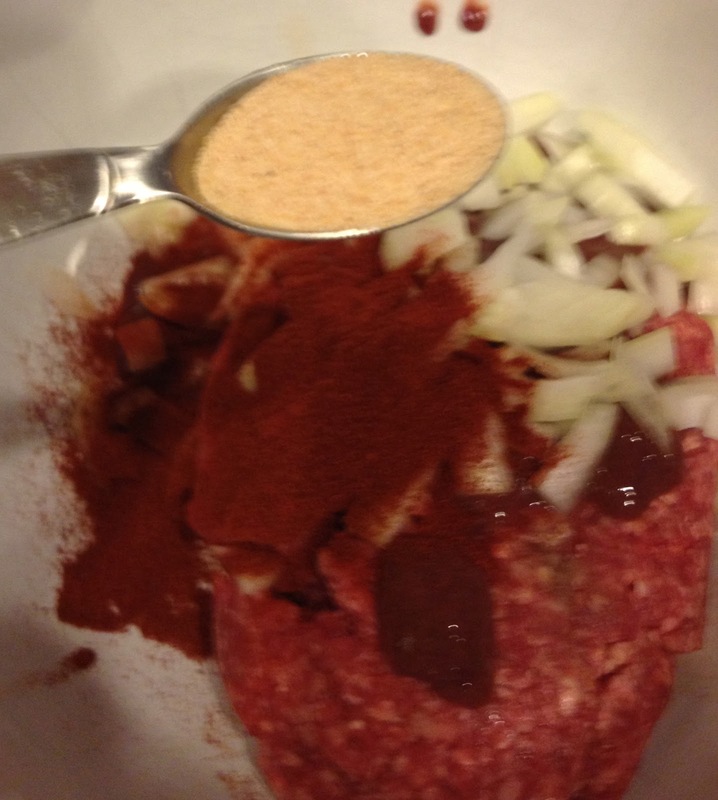 I put on some latex gloves, mixed up the meat, spices and onion with my hands. I then formed my meatballs. You will seriously want gloves. These were the stickiest meatballs I've ever made. 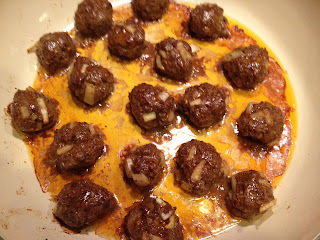 Just meatballs. Nothing unusual here. 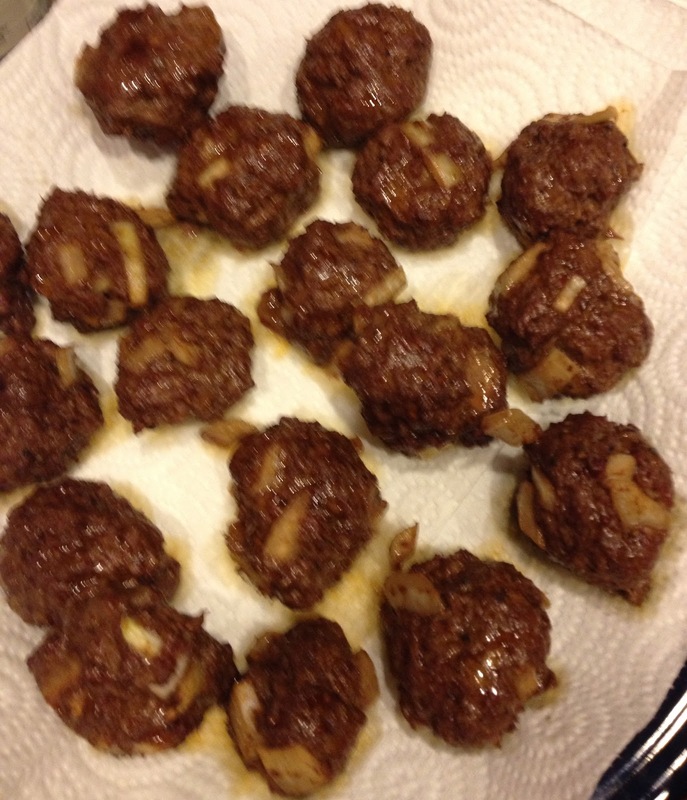 After baking for 25 minutes, here are my meatballs. Though the recipe doesn't say to do so, I put them on some paper towels to drain a bit of the fat before plating a few to try. Hrm. Perhaps basil will make these look more tasty. 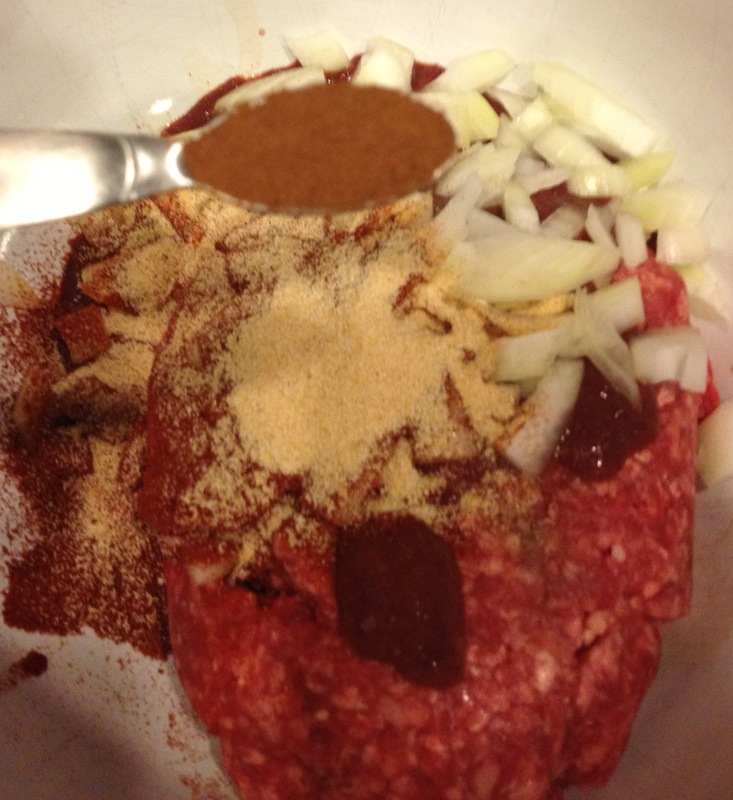 Accessibility and Cost of Ingredients: Where you by and how much your ingredients will cost for this recipe will depend on what quality of liver and ground beef you choose. My big box grocery store does not have a good selection of grass fed anything, nor does it have any beef liver I'd trust eating. I wanted grass fed liver, but Whole Foods was out. I couldn't believe it. I got my liver from Sprouts, for $4.99. I had all of the spices in my pantry. Preparation/Cooking Time: The recipe has a stated 15 minute preparation time and it took me 16 minutes. The cook time was 25 minutes. Clean Up: With the exception of my knife and cooking pot everything went into the dishwasher. 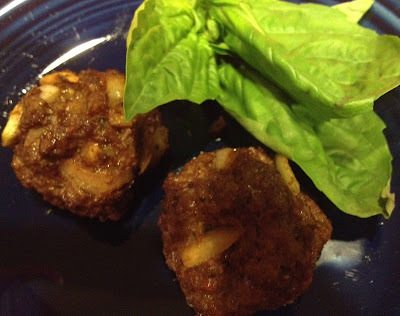 The Paleo Review: Thumbs Down! I took one bite and they just didn't taste good to me. 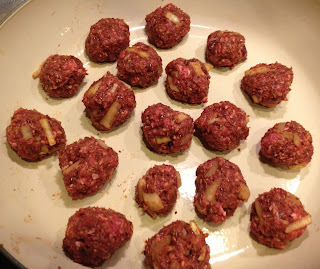 While they look like innocent meatballs, they do not smell innocent. I decided I would take a second bite after hiding the liver/meatball in tomato sauce. I don't see any liver, do you? It was still a no go for me. If you read this post on how Food Lovers Kitchen came around to developing this recipe, they even acknowledge the taste isn't always to be desired. 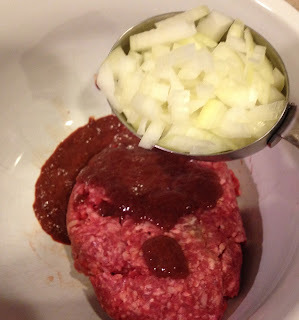 For me, the smell of the liver ruined any possibility I would like these meat balls, even covered in tomato sauce. I recently read a cute article about Dallas and Melissa Hartwig of Whole30's refrigerator wherein they admit they do not like the taste of liver and have taken to freezing liver "pills." This makes me feel a little better about not liking this recipe, or it seems liver, in general. I may make these meatballs without the liver as the seasonings seem like a fine idea. Not to worry, I didn't throw all of them away. I froze them and will be taking them to my mom next week when I visit for Thanksgiving, maybe she'll enjoy them.